This week, we hit 2222 days of reading aloud. I had noticed it coming as I logged our daily reading as we passed day 2200, and since our reading streak is reliable as a daily connection time, I shared with Zoe that we’d hit 2222, and she asked me to blog about it. The reading streak was initially created by Zoe’s request, though for most of the past six plus years, I’ve read aloud to both Zoe and Mia. Sometimes each had a separate book going for me to read. But, in September, we ended our six years of hosting au pairs which meant that Zoe could move out of the girls’ up-to-then shared bedroom, and into the vacant room. So, now I read nightly to Zoe and continue to log it. Mia and I read separately in her room, and she likes to alternate reading to me and being read to and playing games. It’s an entirely different pace. It’s easier to give them each the kind of bedtime they want now that they are not in the same room. Our pace has definitely slowed over the years as Zoe and Mia have become capable independent readers and as busy sports and activity schedules and the constant pull of electronics compete for our shared leisure time. For more than a year now, we’ve been reading the series “Swallows and Amazons” by Arthur Ransome, sailing and boating adventures set in England. Each book takes us more than the nine weeks you get with two renewals from the library, so we pay fines, or if I remember, we request the same book on Zoe’s account, return the one I had checked out, and carry on with our reading. These books are an antidote to our always-connected life now. The child characters have days or seemingly weeks as a pack with their friends to map a whole island, invent pretend worlds, and sail across seas. With each book, I inquire if Zoe wants to continue with the series, and she does. We are nearing the end of “Secret Water” and we await arrival of the next book “The Big Six.” There are four more in the series so that may occupy much of this year of reading. After that, I suppose we’ll branch out. Now that Zoe is interested in more challenging content, I have notions of reading “The Diary of Ann Frank” or maybe something by Ursula Hegi as I have fond memories of reading that aloud to a precocious nine-year-old friend when I was in my late twenties and staying with her family on sabbatical in Brittany, France. Mia and I are currently reading “Wonder” by R.J. Palacio. She has seen the movie. I have not. Mostly, she doesn’t like movies and Zoe has only recently started to enjoy movies. They’re curious about that. I think it’s because we didn’t watch a lot of movies when they were younger so they still find them loud and fast, and kind of overwhelming. Mia also still finds picture books engaging, and she really likes to play games, so a lot of nights her time with me has been in playing Scrabble or Iota or rounds of War. I’ve begun to travel more this year for workshops and trainings, and I give the girls a choice about how to keep our reading and connection lifeline going during these separations when they are home with overnight sitters. 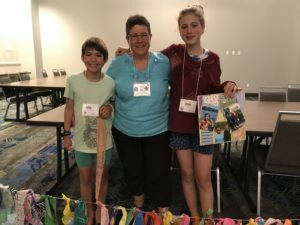 When Zoe went on to a week-long sleep-away camp, she took photocopied pages from the book we were reading at the time, and we read in parallel those days we were apart. When I can call them, to read over the phone or video-call, they prefer that. On one recent trip, when Mia was missing me, she read me a couple of picture books about other mamas and their young, “The Kiss Box” and “Make Way for Ducklings.” It really helped. After that, she got Zoe to do origami with her. For independent reading, both still enjoy books from the library. Zoe has also discovered the Libby app on the iPad and so she can request and read books from the Overdrive collection without involvement from me. The usability is better with that than using the Kindle which requires me to do the final Amazon to Kindle push. As Zoe has started middle school this year, and has moved further away from us in the house, our shared reading time remains a special connection. Even when we’re mad at each other, we read. Even when we get home at 10 pm, we read, sometimes before we go out, sometimes after and only for a paragraph. But, I’d say reading aloud together has become an essential part of our life, and I particularly love when I hear questions from the girls connecting characters from the books to real life situations, or when I hear the girls use vocabulary they could only have learned from reading. This entry was posted in Uncategorized on November 21, 2018 by mara. Dr. Karen Pape wrote the following post on her site in August 2013. Sadly, Dr. Pape died on June 2, 2018. As a tribute to her, I’m reposting it here. Below her post, I share a comment about falling that I wrote in response to her original post. Shortly after Dr. Pape wrote this, I shared my Reflections on Outliers Post by Dr. Karen Pape which in many ways was the seed for the career transformation that I have undertaken this year. In a previous post, I asked people to write me about Outliers…children who were doing more than expected after an early brain or nerve injury. This is Mia, demonstrating a new skill on her 4th birthday. When you watch her “Skinning the Cat”, it is hard to believe that she had a stroke in the early days of life. The damage was to the left side of her brain, causing a right hemiplegia. Yet holding on to the rings, both hands and arms are working equally hard. Both legs swing up and over. There is no evidence of the hemiplegia. This result is not magic – it is the result of a determined child who has adopted the “I can do it” philosophy taught to her by an equally determined mother. I think both of them qualify as Outliers! Her mother’s description, still shots and videos, take you step-by-step through Mia’s learning process. First and foremost, Mia expects to be able to accomplish this task and she works hard, through many failures, until she reaches her goal. She is encouraged by her mother and also has the added role model of her older sister. If Zoe can do it, then I can do it! I am quite sure that during the learning process, Mia has taken some falls. She probably had a few bruises as well. Learning a new skill is a series of failures, trying new methodologies and finally success. Mia has the advantage of watching her older sister work through the same sequence of learning and she is up to the challenge. How many children with an early brain or nerve problem are allowed to fall? When I was in clinical practice, I always checked young children for bruises on the legs. It is a normal finding in growing, exploring children. The absence of bruises often means there is an excess of watchful helpfulness. The cognitive neuroscience experts…and master coaches…understand the simple reality that learning is an experiential process. No able-bodied child has ever learned to walk without a lot of falls. Brain neuroplasticity is activated by a novel challenge. In the absence of challenge, the child’s normal habits dominate. In the past, many therapists had tried to get Mia to extend her arm and grasp. She learned how to do it when she had to…new habits are formed by novel, challenging tasks that have consequences. 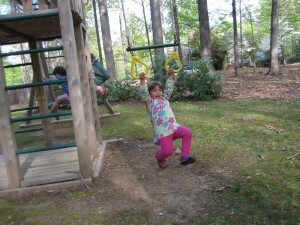 Read the whole post about Mia’s learning process. Her mother and sister offer some guidance and ensure her safety, but the process of trial and error…by Mia…is the way her brain learns the task. At the end of the video, Mia says, “I flipped”. Her pride in herself is a precious gift and I am grateful to Mia’s Mom for sharing her story. We need more of them. It’s such an honor to have Mia featured here along with Zoe and me. Thank you. And, you guessed right, she definitely has fallen over and over. She falls all the time and happily proclaims before I can say anything, “I’m okay Mommy!” Then, she hops up and continues doing whatever has captured her attention. And manipulating band-aids for all those little boo-boos is excellent fine-motor practice for both hands, fundamentally a bimanual task. Just yesterday, we were at a play structure and Mia was playing on a triple trapeze swing, similar to the one in the video above. Just six weeks after first doing skin-the-cat, she continues to take new risks. She can hook her legs with knees bent over the bar and hang head down. She was so bold as to let go with her hands and hang there for a few seconds seeking a thrill. And then, just as I was starting to panic wondering if she’d be able to find her grasp again on the rings she did and she flipped off the bar and had the biggest smile. It takes some training as the parent to stand by and witness this kind of courage and determination, but the rewards are tremendous and often surprising. 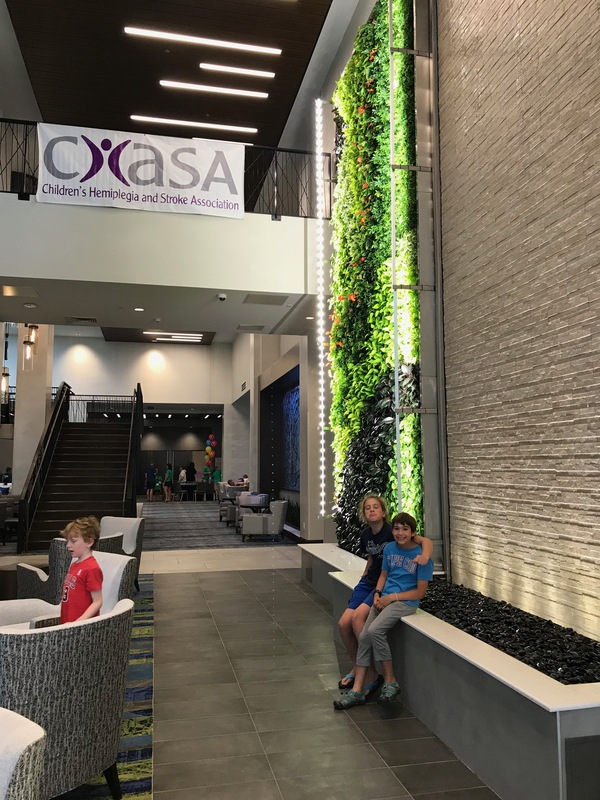 This entry was posted in Case Study and tagged Dr. Karen Pape, Mia, Outlier on June 15, 2018 by mara. 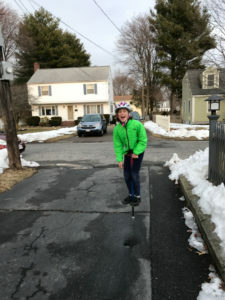 This morning, I mentioned to my girls that a year ago I had posted about their pogo sticking feats. Zoe reminded me that she led the way and inspired Mia to want to learn this new skill. When I commented that Zoe hasn’t been pogo sticking lately, she said that she has outgrown the one pogo stick we have so it’s time to upgrade. 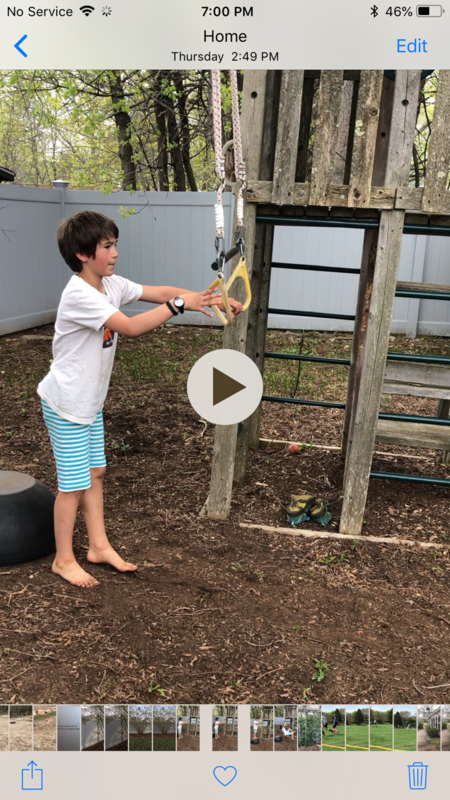 Here’s Zoe in action with Head-and-Shoulders thrown in for fun in March 2017 at age 10. Zoe’s tricks on the pogo stick motivated Mia to master her own tricks. A year prior to this, Mia had a hard time making the pogo stick go down. Here is Mia “one handed” with her tongue out to help focus! 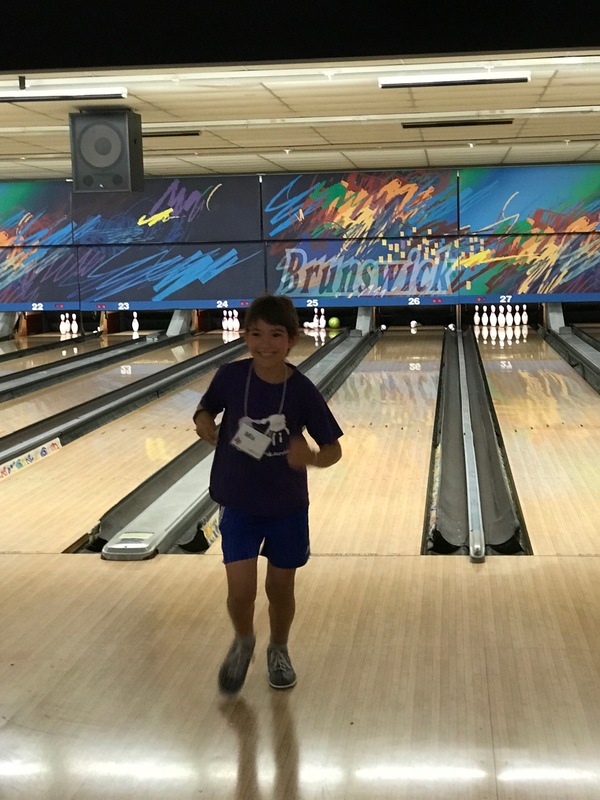 Variety is one ingredient in healthy movement development so part of what I am sharing this month are many of the different activities Mia tries. Pogo sticking requires balance, timing, and comfort with falling. Here’s Mia in 2017 at age 7. And, here is Mia this year in 2018 at 8 years old. 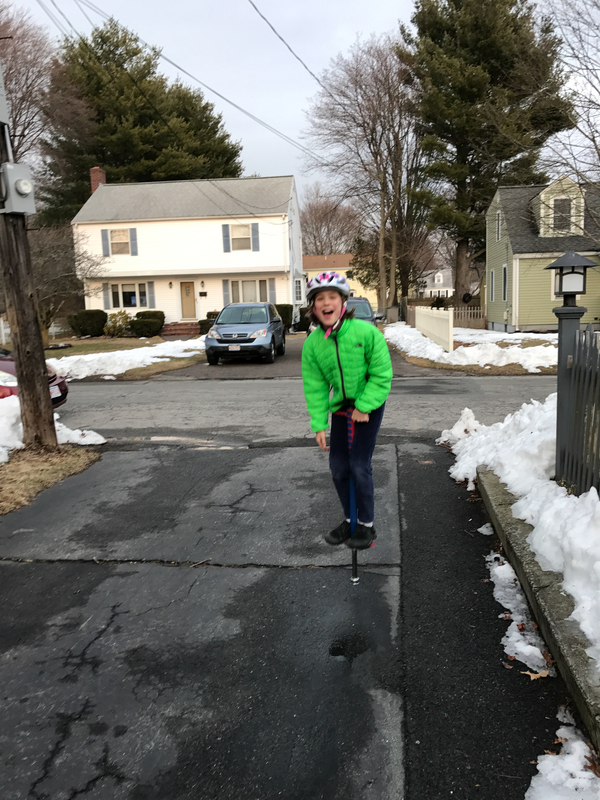 This entry was posted in Case Study and tagged balance, challenge, Mia, pogo stick, tongue, Zoe on May 17, 2018 by mara. This picture is from the grand opening celebration of the Christa McAuliffe Branch Library in May 2016. 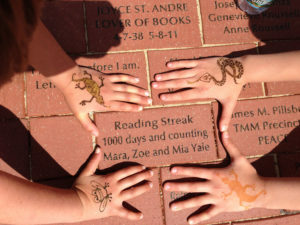 An artist drew these fun henna tattoos on the girls’ hands. I bought this brick nearly a year prior to support the library construction. At the time of the brick installation, we were at 1327 consecutive days of our reading streak. Now, we are a month beyond 2000 Days of Reading Aloud. These days, I spend a lot of time at the Christa McAuliffe Branch Library. It has great light, tons of windows, and plenty of quiet working space. Each time I enter, I find our brick. While I’ve read to both girls since birth, Zoe initiated the reading streak, and we have promised to keep it going as long as we can. Mia’s interest and endurance come and go, sometimes it’s “too many words” and other times she joins us. Both girls are capable readers and still love being read to at least once and sometimes twice each day. Sometimes we have two read-aloud books going at the same time, one of each girl’s choice. Car rides got easier once both girls were interested in the same books. This beats the couple of years when our long drives alternated between an hour of quiet (Mia’s frequent choice) and an hour of listening (Zoe’s preference), and all the associated negotiations about who gets to go first and when it’s time to transition, especially if we were mid-chapter. About ten days ago, in anticipation of the release of The Penderwicks at Last, the fifth and final book in the series by Jeanne Birdsall, Zoe was rereading Harry Potter, and she told me that she planned to finish reading the sixth and seventh Harry Potter books then reread all four Penderwicks books so she’d be ready for the fifth book. She did it. The newest Penderwicks book arrived yesterday and she read it straight through. Some school and household tasks get put off when she’s in a reading burst like this; it’s hard even to convince her to stop to eat or move her body. 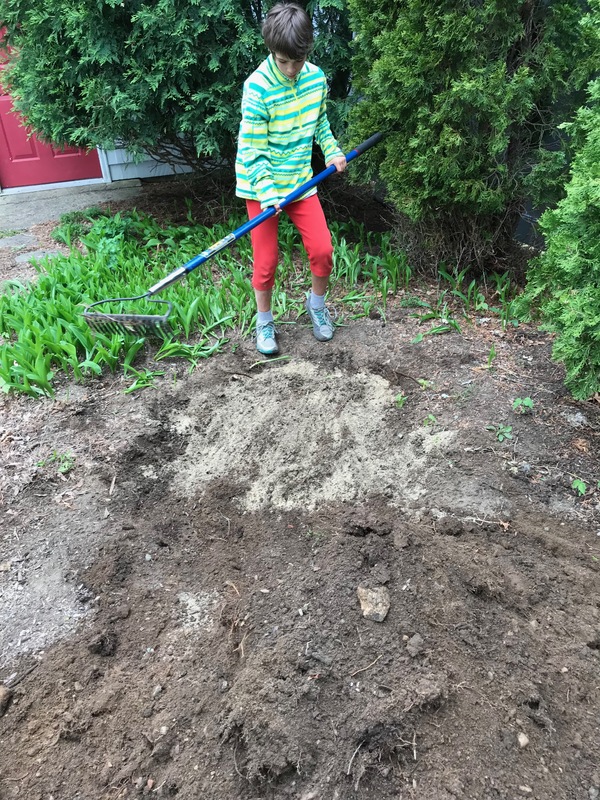 This entry was posted in Reading Streak and tagged Mia, Penderwicks, reading, reading streak, Zoe on May 16, 2018 by mara. I wrote the post below when Mia was eight months old and Zoe was newly 3 years old. I was thinking about my mother yesterday, on Mother’s Day, how complicated relationships between mothers and daughters can be, how messy ours was. I was thinking about my own girls, about the imperfect parenting I’m doing. I was thinking about how all mothers do the best they can with the resources they have. 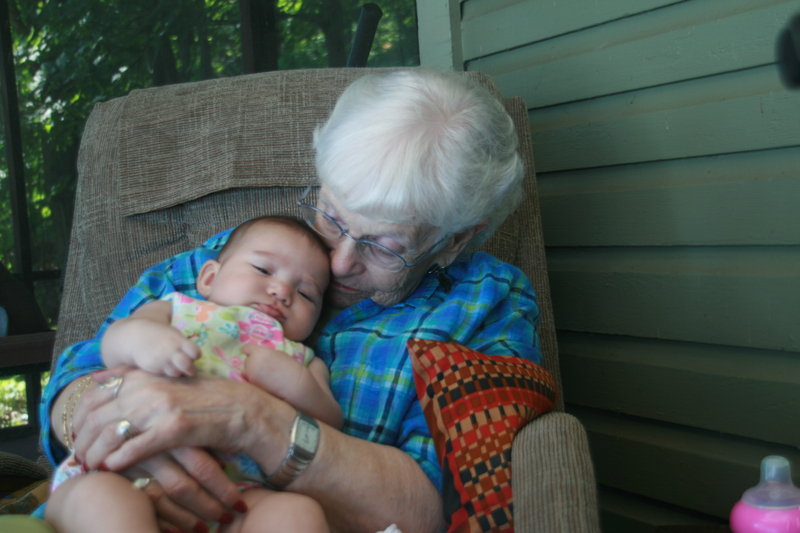 And, now eight years after I first wrote this, I’m sharing it again here, even more grateful that I made the effort to repair my relationship with my mother in the limited time she had as a grandmother to my children, as a mother to me as a mother. 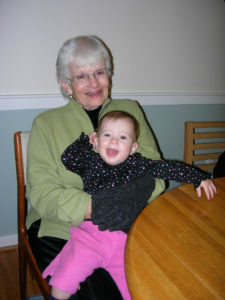 November 2007, Grandma Barb holding Zoe (10 months old). August 2009, Grandma Barb holding Mia (2 months old). August 2009, Grandma Barb reading “The Little Red Hen” to Zoe (2.5 years old). A month ago, I drove to Ithaca for my last visit to see my mother. Two days before that was our last of many hundreds of nearly nightly phone conversations over the past three years. I didn’t always talk with her daily. There were many years where I understood that her expectation was that I’d call each week and I dutifully did so, sometimes with stressful anticipation for many days worrying about what zinger of a remark she might make, what questions she might ask that I’d need to artfully avoid, and of course what small parts of my life I felt comfortable and safe to share with her. But, something shifted when I became a mother myself. My mother’s last visit to the Boston area was for a baby shower when I was 7 months pregnant with Zoe. My sister Amy brought our mother and they stayed at Nan’s house where together my sisters threw me a beautiful baby shower. My mother enjoyed the trip, delighting in being part of the celebration of another grandbaby-to-be, reconnecting with friends of mine from high school, college, and meeting some more recent ones for the first time. Her ability to travel was limited. Her health was fragile even then. And, her days were pretty monotonous. She spent a lot of time watching TV. She managed to get out to the pool 3-4 times a week for some water exercise. She had home health aides to help her get to her appointments and manage her own selfcare. She saw my 2 siblings who live in Ithaca frequently, and the rest of us less often. So, I started to call, daily. In the early days when I was on maternity leave and spending great amounts of time sitting around nursing Zoe, it was fairly easy to call, and it helped the time pass. My mother enjoyed hearing about every little milestone, hearing Zoe’s coos through the phone, and I suppose remembering her own days nursing each of her 6 babies as newborns. Then, there were the few months that I started working part time while my house was also being renovated. She was interested in everything, Zoe’s adjustment to daycare, my return to work, progress on the house. 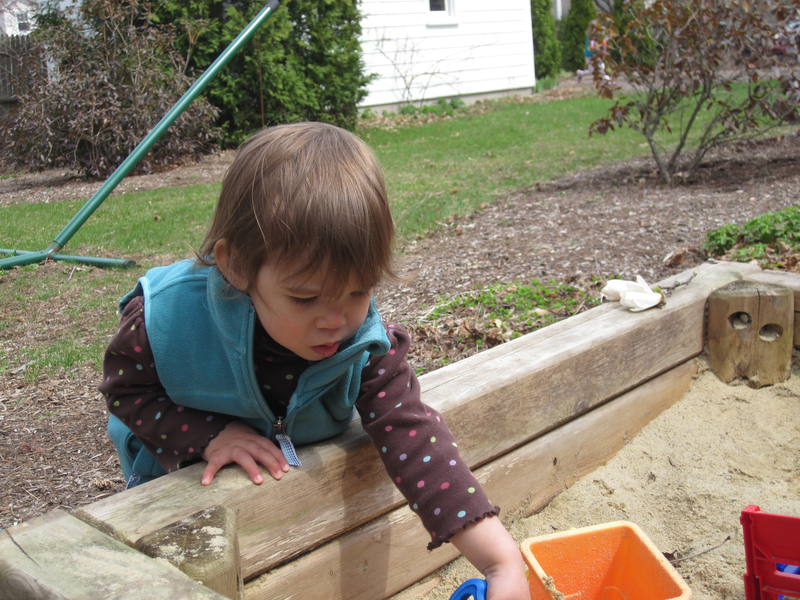 We visited Ithaca every 2-3 months during Zoe’s first year so my mother often would say that she couldn’t wait to see Zoe doing this or that, whatever I had told her she was doing now. I also sent pictures every month. And, when I visited, she had albums ready waiting for me to fill with these pictures of Zoe. I have all those albums now. In fact, they’re the only photo albums I have of either of my kids. All my pictures are in digital albums and any prints are in a big box. There are several more months worth of prints that are in the basket where my mom collected them. I suppose they’re waiting for me to continue the tradition, to find an album and fill it. I might just need to make time for that. Sometimes these conversations were as brief as 5 minutes, other times they were longer. It really depended on what was going on with us, how much attention Zoe needed, what else I needed to get done. As Zoe started to talk, she could say things directly to Grandma Barb. At some point, they began a nightly tradition of “Night, night, don’t let the bedbugs bite!” Only, my mother didn’t like bedbugs, so she asked Zoe to start a variation on the game. So, bedbugs were replaced by monkeys, kangaroos, koalas, and tens of other silly things that do and don’t really bite. At times, mostly when Zoe was two, she didn’t want to call Grandma Barb, so I struggled to keep it interesting for her. Sometimes, we read stories together over the phone to Grandma Barb. Sometimes, Zoe’d be contentedly playing and I’d get to have an adult conversation with my mother, usually brief, often interrupted, but still a useful break from an evening of chatter with my extremely verbal toddler then preschooler. These conversations went on through my whole second pregnancy. I didn’t know if I was having a boy or a girl. My mother wanted to know. She was impatient to find out. She was very excited that I had a second girl. And, then she was as worried as anyone when Mia’s early health complications arose. At first, I was too overwhelmed to call her. Eventually, I did. She was frustrated and felt left out because a lot of the fast, real time communication in the days immediately before and after Mia’s birth went via text messages and e-mail, media she was not able to manage herself. My brother Andrew printed hard copies of these sagebaby posts and brought them to her. I have her stack of them, in the folder with flowers on it, where she kept them. She read them so carefully, and followed up with questions when we talked. At one point, she corrected me about Mia’s weight. She was sure that I had gotten it wrong in a post. In fact, she was right, I had made a typo off by a pound, and I went back and fixed it after she told me. Unbelievable. She tried to keep track of every early appointment that Mia and I had. It was a lot to remember and so she’d ask me over and over again for the details and the sequence. She’d follow up to learn what had happened. She was remarkably understanding when I was unable to plan to visit until late August when Mia was almost 2 months old. On that visit, she enjoyed Mia so much. Mostly, I’d put Mia in a spot where my mom could watch her – in her carseat with a toy dangling for Mia to bat at with her hands, or on the baby gym mat where Mia looked at her toys and started to hit them. And, she held Mia too as much as she could. Even in August, it was tricky for me. I had to make sure my mother was in a chair with enough support that I thought Mia would be safe. In September, my mother was hospitalized with pneumonia for 5 days. She was released with round-the-clock care at home and lived most of her last 5 months in one room. And still we called. I took Mia to Ithaca to visit right away, left Zoe for 2 nights with a friend from work. We all visited her in Ithaca again for Thanksgiving. And then, one last trip – Valentine’s Day. All together my mom saw Mia on 4 trips we made to Ithaca in her first 8 months. Mia had started to “talk” in our phone conversations, jabbering loudly enough that my mom would talk back to her. In the weeks before her final illness, my mother said so many times that she wished she could come help us. She knew I was stressed juggling my two girls and work and the household maintenance. She tried to suggest things that might help. She was eager for us to visit again, though she knew that we were not ready to travel because of illness, weather, and my work. She said that she couldn’t wait for spring so I could bring my girls to visit again. Spring is coming soon, perhaps jump-started today by the clocks springing ahead and the rain falling all day long. We can’t visit her now. All we can do is remember and find small meaningful ways to keep her spirit alive for these girls who only barely knew her. I can continue the photo album tradition. I can wish Zoe “Night, night, don’t let the *** bite.” Lately, Zoe’s been wanting me to say “bedbugs!” Funny. I can go shopping for a baby doll for Mia. I had told my mom that Mia recently started to play with Zoe’s two baby dolls. My mom wanted me to get one (from her) for Mia that’s exactly like the one she gave Zoe at Thanksgiving 2008. I was busy. I didn’t go right out to get it even though she kept asking me about it. Soon, I will. This entry was posted in Uncategorized and tagged Grandma, stroke on May 14, 2018 by mara. While Mia is more drawn to team sports than gymnastics, she continues to challenge herself on our backyard play structure and on similar challenges at larger playgrounds. She’s come so far from five years ago when she first managed to skin-the-cat, as the flip over is called on this triple trapeze bar with two rings. I love her inventiveness, how she does the movement to get her feet to flip over and then reverses it, then she starts from the midpoint, to flip back, again and again. As you watch the videos, notice how she is patient with herself, giving her right hand time to find its way into the ring, to grip, how she leads with her left hand but waits until both hands are participating to flip herself over. She uses her eyes to help make sure her right hand is where she wants it to be as her sensation in righty is reduced. Mia had a stroke at birth and has right hemiplegia, affecting her right arm and hand. 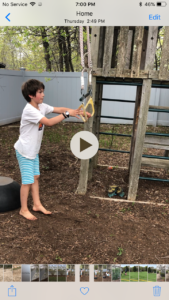 This entry was posted in Case Study and tagged hemiplegia, monkey, righty, stroke, triple trapeze on May 8, 2018 by mara. Mia loves to climb. 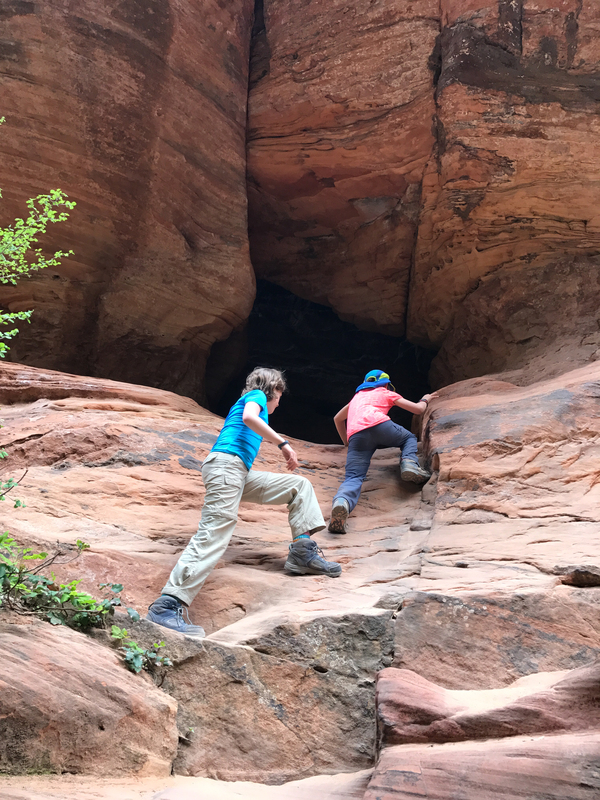 Here she is at age seven, after hiking Angel’s Landing in Zion National Park, leading her older sister Zoe up to explore a little cave. She uses all four limbs while climbing and scrambling, which is therapeutic but mostly just fun! Mia had a stroke at birth and has right hemiplegia. 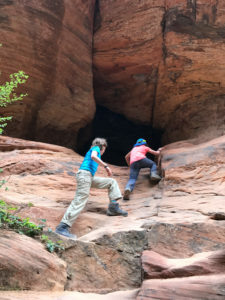 This entry was posted in Uncategorized and tagged climbing, hemiplegia, stroke on May 7, 2018 by mara. 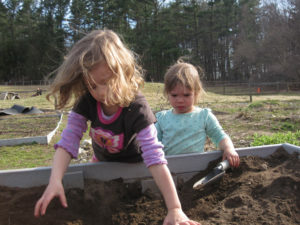 Both of my girls have long loved digging in the dirt each spring. Here they are at 4 and nearly 2 years old. And, in the next picture, you can see how Mia is bearing weight on her right hand while digging with lefty in our backyard sandbox. We also would play “wheelbarrow” where I’d hold her feet and she’d walk on her hands (not many pictures of that as I was usually the one holding her feet). This was great for weightbearing on both hands and for balance. Mia had a stroke at birth which largely affected her right hand and arm. This afternoon, we set out to solve a puppy predicament. This morning, too early, our doorbell rang. I was asleep as the fifteen month old dog still wakes me up too early most days so I had fallen back asleep. The girls were up though and had let him out in the fenced back yard. Well, those holes he’s been digging finally panned out for him. He escaped into the neighbors fenced-in back yard, and was brought back to our front door by our lovely neighbor. 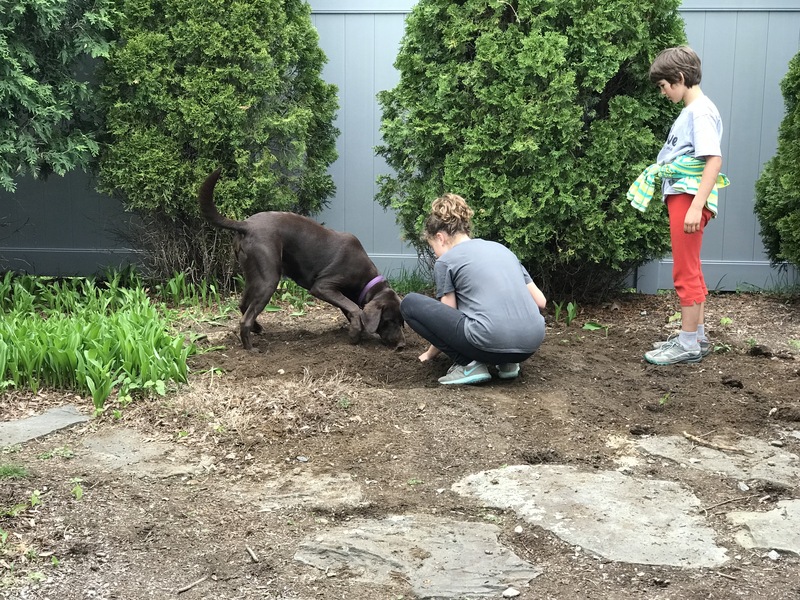 After researching a bit, and filling in the holes along the fence as best we could with bricks, dirt, and rocks, we decided to create a digging pit for Toby in a place where he already likes to dig. 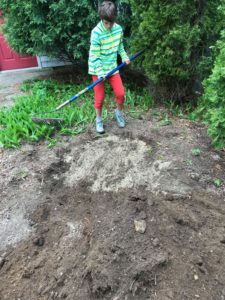 So, we dug a hole, and then used the wheelbarrow to transfer some sand from the sandbox that my kids have outgrown to the pit, layering sand and dirt, to make it a digging spot. Now, Mia can fill and push a wheelbarrow on her own, and it’s great for helping her use her whole self to coordinate balancing the wheelbarrow. She holds the metal rake the same way she holds a hockey stick when she’s skating out, and opposite from how she holds a lacrosse stick (for that she has her right hand near the end and her left hand near the head of the stick). Zoe joined in the action for the training part. The girls buried Toby’s toys in the new pit and encouraged him to “find it.” Time will tell how effective this solution is for Toby. Meanwhile, he’s only allowed in the back yard with supervision. I’m pretty sure he’ll try to escape again. 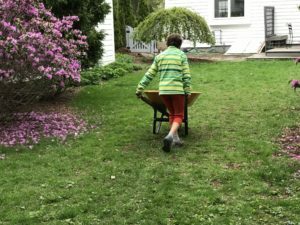 This entry was posted in Uncategorized and tagged digging, stroke, weightbearing, wheelbarrow, yard work on May 6, 2018 by mara. At age 5, Mia was able to peel and cut a cucumber independently with some supervision. She has more limited use of her right hand due to a stroke at birth and resulting hemiplegia. 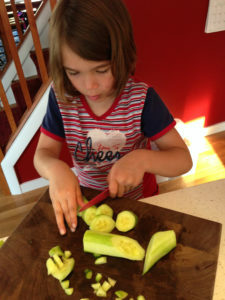 Notice how she’s using her right thumb to hold the cucumber in place. 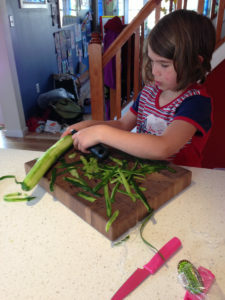 For kids and adults with more limited use of their affected hand, cutting boards are available that hold things in place. 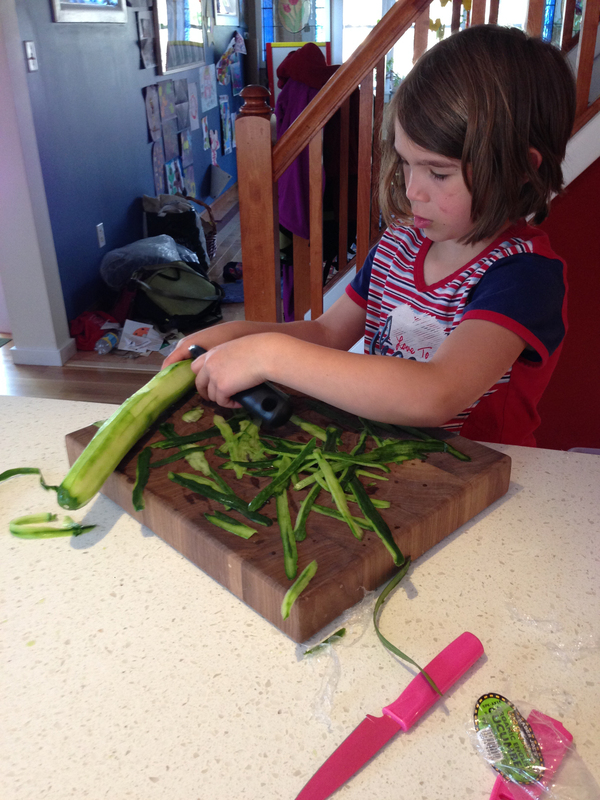 Today, at age 8, she used a utility knife to cut through cardboard for a school project. I don’t have a picture of that because I was supervising a bit more closely. 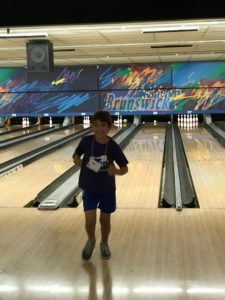 This entry was posted in Uncategorized and tagged cutting, hemiplegia, righty, stroke on May 5, 2018 by mara.